The first time I heard the word field hockey was in the middle school announcements’ in sixth grade. I didn’t do a fall sport and I was really nervous about starting something new in middle school. Towards the end of the season in seventh grade I started to get a feeling that this would be my sport throughout high school. Nothing interested me more than field hockey. Field hockey is a winter season sport with 58 girls playing in middle school and 18 girls on the Varsity team. When I tried out for field hockey in high school, there was only one varsity team and it was either you make the team or you get cut and can’t play the whole season. The possibility of not making the team caused me to practice a lot before tryouts. I still remember the day I got an email from my coach and that was probably the highlight of my year. Despite the cold weather that would make my fingers feel like they are shattering when I hit the ball, going to practice was never a pain for me. I felt comfortable being part of the team and I really loved my teammates. During my freshman year I was subbed in and out a lot during games. It frustrated me because I wanted to be part of what was happening on the field. I still have a vivid memory of when ASIJ played against CAJ and when I got in the car I wasn’t able to stop myself from thinking, why wasn’t I able to stay on the field. The answer was pretty simple. I wasn’t good enough. In fact, during my freshman year I didn’t score a single goal. From that day on I practiced harder and harder. That memory motivated me to do whatever I can to stay on the field. I talked to my dad about going to camp and he signed me up for two sessions at the University of Michigan Field Hockey Camp. I was basically thrown into a place where really good players surrounded me. At first I was nervous because these players had a variety of skills beyond my own level. Working with college athletes and coaches from different universities and teams helped me understand the importance of each strategy and skill. For the rest of the summer, I played around with my stick and ball just to see if I could copy the people I saw at camp. Surprisingly, this really helped. By the time I came back to Japan, I knew how to air dribble. Even after I came back, I went to school and practiced skill work. During the beginning of the year I practiced Monday through Friday. I also made sure I took a strength training class to get myself ready for winter season. As I went further into the semester, homework would get in the way, but I tried to get out on the field three times a week minimum. Feeling the temperature drop was like a count down to tryouts and just thinking about the season made me smile. This year, I wasn’t so nervous and was able to keep my confidence (which is an important aspect in playing field hockey). Janet and Hana at practice. When I walked onto the grass-patched field for field hockey tryouts as an eighth grader, I had no idea I would end up playing a college sport. I had barely heard of field hockey, and while I enjoyed honing my hand-eye coordination in volleyball, the physical endurance field hockey requires posed an unprecedented challenge. I enjoyed the season and continued playing in ninth grade, on the JV team. After attending a summer camp, I then played on ASIJ’s Varsity team for the following three years. After submitting my college applications knowing next to nothing about NCAA athletics, Vassar College’s Head Field Hockey Coach contacted me about the possibility of playing at the Division III level. As a Kanto Plain All-Star senior captain of our undefeated league and tournament champion team, my common application description of my athletic achievements depicted me as a promising field hockey player. Due to its academic rigor, Vassar was one of my top choices for college and I decided I had nothing to lose. 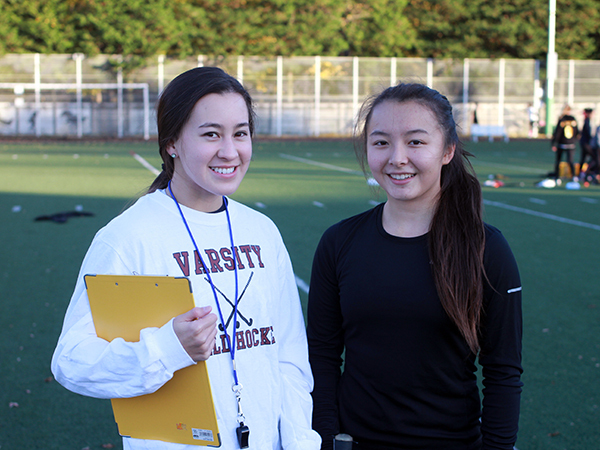 A friend filmed me playing with some teammates on the field at ASIJ and Coach Walker wrote a recommendation for me. Upon reviewing my video and recommendation, Vassar’s Field Hockey Coach invited me to try out for the Varsity team that August. Having received the arduous mandatory Summer Workout in May, I arrived at Vassar with months of intense running and sprinting behind me. But when we scrimmaged on the first day of pre-season, I quickly realized I was the worst player. In comparison to my teammates, many of whom had played for their State championship teams, my stick skills were non-existent. The level of play I was used to in the Kanto Plain league was simply incomparable to the highly competitive level in the States. My first college field hockey season was difficult. I decided that if I were to continue, I needed to improve or else it was not worth the extensive time commitment, which entailed arriving back to my dorm room past midnight on numerous week days due to away games, not to mention the 6am team-lifts and conditioning we had to do every week in the cold Poughkeepsie winters and springs. During the summer before my sophomore year, I woke up at 5am nearly every day for over ten weeks to practice my stick/ball-handling skills before completing the daily mandatory Summer Workouts. The hard work paid off and I earned a starting position in the beginning of my sophomore season and the Most Improved Player Award at the end. Returning to ASIJ to assistant coach Varsity Field Hockey and teach in the Middle School and has allowed me to come full circle. When drawing out diagrams of drills for this year’s Varsity Field Hockey team, I often find myself imagining Vassar’s turf, trying to construct an aerial-perspective of where my teammates and I ran or dribbled during our most effective drills. 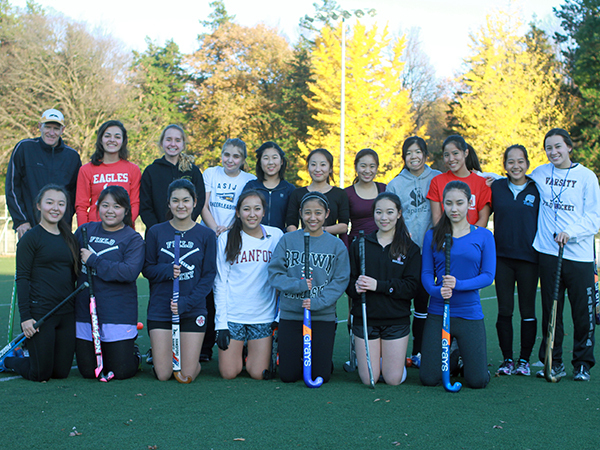 It has been exciting to teach ASIJ’s field hockey girls some of the stick skills I learned while at Vassar and inspiring to see the girls’ camaraderie across grades—knowing that these bonds will only grow stronger as the season progresses.